Lindsay Kinkade is a teacher, public artist, community-based designer, and documentary journalist. 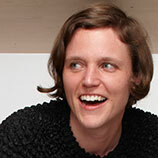 She is the co-founder of Little Giant, a design firm in Providence focused on public engagement research and projects. Lindsay’s primary research interests include participatory design and visualization of complex systems. She teaches at RISD and is also the Design+Communications Coordinator for NSF EPSCoR at RISD, a collaborative research project on climate change. A former visual journalist at The Boston Globe, Lindsay brings an ethical framework and research rigor to every project. She most recently taught RISD’s interdisciplinary healthcare reform visualization course, Making It Understandable. Her students designed the public engagement materials on display in the auditorium lobby during the symposium. The class blog is available here.